2009 Easter service at St Mary’s Church, Hassaka. Now only 200 Christian families remain in nearby villages. (PHOTO: World Watch Monitor). 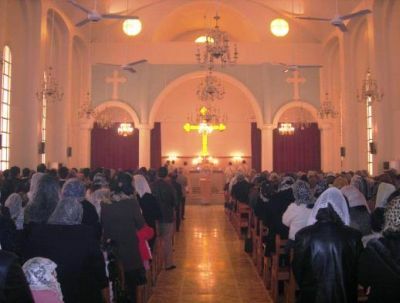 Sources from Syria’s embattled Hassaka province confirmed at midnight on Tuesday, February 24, that at least 72 Assyrian Christian families – thought to be around 200 people – from three villages have been captured by the self-proclaimed Islamic State. Reportedly taken to the Arab Sunni village of Um Al-Masamier, the exact number of Christian hostages from the Tel Gouran, Tel Jazira and Tel Hormizd villages remains unknown. 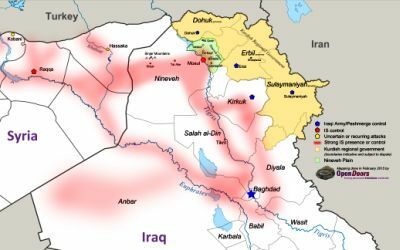 IS presence across Syria and Iraq shown by red shadow, 25 February 2015 (PHOTO: Open Doors International).